This CD is no longer available from Bongo Beat. THIS IS A SUPER AUDIO DISC, HYBRID SACD, PLAYABLE ON ALL SACD AND REGULAR CD PLAYERS. 5.0 MIX. Mastered by Graemme Brown, a SACD specialist who works on SACD discs for Concord Records, Chick Corea, and others. Disc manufactured by the Sony SACD plant, USA. Even if you don't have a SACD player, the disc's superior audio will shine on any cd system, especially home theatre. "Miss Mortifee has a voice like a dark lark and a faraway look of mischief in her eyes." Clive Barnes, New York Times. This is a wonderful quote from early in Ann's career that has proven timeless in its prescience. 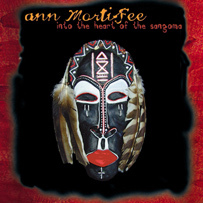 Into The Heart Of The Sangoma is the first album in over 10 years from Ann Mortifee; legendary singer / composer / playwright / actress / spiritual teacher. A personal journey back to her South African homeland, guided by the wisdom and visions of the Sangoma, the shaman of the Zulu nation. A powerful journey, riveting in its scope and Ann Mortifee's four-octave vocal power. Featuring studio, live, and field recordings from an actual Zulu blood ceremony. An incredible journey of empowerment. Ann Mortifee is best known for Serenade at the Doorway, a CD created in collaboration with psychologist David Feinstein (author of Rituals for Living and Dying) as a tool for palliative care situations. Ann has spent the last 10 years as a speaker in this field (and for which she was awarded the prestigious Order of Canada) and we are happy she is making her artistic and musical return on the Bongo Beat label (http://www.bongobeat.com) where individual vision is our lifeblood. It is a rare honor to work with such an artist and look for the re-release of all of Ann's out-of-print albums on our label over the next two years (including Baptism). Ann Mortifee's artistic path has crossed so many boundaries and disciplines; good luck to anyone trying to create a succinct overview of it all. Born in South Africa, Ann left for Canada when her father, a politician against apartheid, decided it was best to move his family elsewhere. In Vancouver, she began performing in coffeehouses at the age of 16, and discovered by the legendary Josh White Sr, who became her mentor/advisor. From there, Ann went on to compose the score and star in The Ecstasy of Rita Joe (with Chief Dan George and Paul Horn), co-host a TV Show (Both Sides Now), star in the record-setting Jacques Brel Is Alive and Well and Living in Paris (she was discovered by EMI producer Norman Newell at the New York shows); all the while composing for BBC TV, National Film Board Of Canada, and various ballet companies (including the North Carolina Dance Co). Her first solo lp, Baptism, was recorded at Abbey Road Studios and released worldwide on EMI. Her albums have been on EMI, United Artists, Warner, and her own Jabula label. At the height of her first flush of success, Ann left it all to travel for three years into the heart of Beirut and Calcutta (where she worked with Mother Teresa). These life experiences became Journey to Kairos, a stage show/album/award wining TV special. It cemented her reputation as a musical pioneer, creating world music before it became as defined as it is today. "Charlie Mingus would have been better served by recording with Mortifee rather than Joni Mitchell"
- John Kiely, Kitchener-Waterloo Record, 1981. At this time, Ann reached a wider audience touring with Ramsey Lewis, Michel Legrand (with whom she co-wrote "Born to Live"), Harry Belafonte and others. In 1982, her children's play Reflections on Crooked Walking debuts on stage and on record. "Ann Mortifee is the greatest thing to come along since the invention of sliced bread"
- Robert Conrad, WCLV, Cleveland. It was media personality Robert Conrad who created a following for Ann in Cleveland with TV specials, concerts and plays (An Arabian Knight, Jacques and Maddly, both at Cleveland Playhouse). But everything changed with Serenade at the Doorway; Ann decided to focus the power of her music for healing and comfort. With no publicity, the CD quietly sold over 50,000 copies, mostly by mail order. And now with Sangoma, her 10th album, Ann is returning publicly to her music, making a very empowering statement about the mystery and magic of her African homeland. Into The Heart of The Sangoma will be available in record stores as follows: If it is not in stock, please tell them it is on Bongo Beat Records, UPC: 767000197429 and available from the distributors noted above.